Unlike oceanic spinner dolphins, Hawaiian spinners are found close to shore in shallow coves and bays during the day. In these important nearshore habitats, Hawaiian spinner dolphins rest, care for their young, avoid predators and engage in reproductive activities vital to their survival. The spinner dolphin is named for its unique habit of leaping out of the water and spinning in mid-air. This species tends to travel in large herds of between 10 and 100+ animals. Hawai‘i’s spinner dolphins feed at night in the open ocean. They feed on organisms that rise toward the surface at night, such as small squid, lantern fish and small hake. Females reach sexual maturity at 5-12 years of age. Normally, adult females can give birth to a single calf every second or third year. Calves are weaned at 7 months of age or more. Although the maximum age is unknown, the spinner dolphin's lifespan is believed to be over 20 years. Exact population numbers are not known. Spinner dolphins are protected under the Marine Mammal Protection Act. Under the act it is unlawful to "take" marine mammals, including spinner dolphins. "Take" means to harass, hunt, capture or kill any marine mammal or attempt to do so. "Level B harassment" means any act of pursuit, torment, or annoyance which has the potential to disturb a marine mammal or marine mammal stock in the wild by causing disruption of behavioral patterns, including but not limited to, migration, breathing, nursing, breeding, feeding, or sheltering. When observing spinner dolphins in the wild, the recommended distance for observation is 150 feet (50 yards) to avoid potential harassment. When in doubt, move away if the behavior of the animal changes. when approached. Learn more about the Dolphin SMART program that promotes responsible stewardship of wild dolphins in coastal waterways. Find out which businesses are Dolphin SMART! 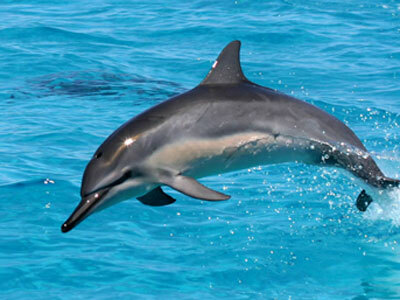 SPINNER DOLPHINS ARE PROTECTED IN HAWAI`I! ~ Report violations to the NOAA Fisheries Enforcement Hotline at 1-800-853-1964. ~ Report marine mammal emergencies (including injuries and entanglements) to NOAA Fisheries at 1-888-256-9840.